In this chaotic age of new technologies, downsizing, andreengineering, managers and executives are relying more and more onthe consultant. Hiring the right consultants for your company andmaking effective use of them is a vital skill, and yet there hasbeen a lack of guidance on this topic-until now. 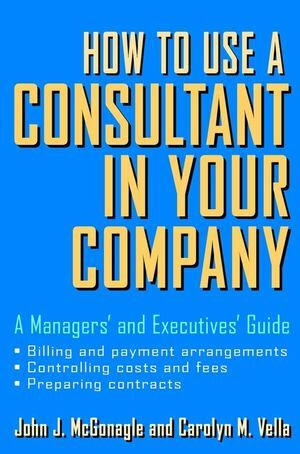 Including forms and other materials for help in developing formalpolicies, billing procedures, and more that you can adapt to fityour own situation, How to Use a Consultant in Your Company is theone-book-fits-all solution for anyone responsible for getting themost out of their company's consultant. JOHN J. McGONAGLE, JD, LLM, is a consultant and the author orcoauthor of eleven business books, including Business Agreementsand The Internet Age of Competitive Intelligence. He previouslyserved with the President's Private Sector Survey on Cost Control,providing expert advice on managing consultants. McGonagle has alsoheld senior staff and officer positions for major financialservices corporations. CAROLYN M. VELLA is the Founding Partner of The Helicon Group andthe author or coauthor of eight business books, including ImprovedBusiness Planning Using Competitive Intelligence and Master Guideto Control of Corporations. Her global consulting practiceencompasses clients from Australia to South Africa and from Canadato Switzerland. The Paper Trail: Corporate Policies. The Paper Trail: Contracting Issues. Finding and Selecting the Right Consultants. Appendix B: Extracts from Sections 1 and 2, IRS PublicationNumber 15a, Employer's Supplemental Tax Guide (1999).